At the very, very end of a wonderful tour of the King House Museum in Suffield, back in the cramped little tobacco history section of the house (Suffield has a rather important role in Connecticut tobacco production), I noticed a tiny little photograph of a small monument taken somewhere in Suffield marking and celebrating the very spot of the first cigar factory in the entire country. I felt sort of badly for my guide, who was great, because I think of all the cool stuff she had shown me over the last hour or so, this little photo got me most excited. So Nancy, when you read this, I’m sorry. 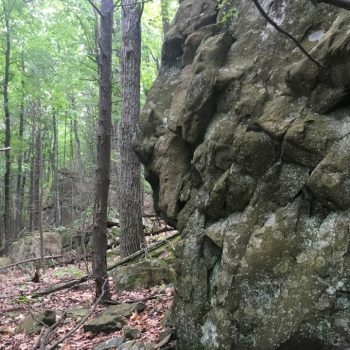 I’m sorry that I’m a weirdo who finds these little morsels of completely random “Connecticut firsts” just a tiny bit more interesting than Eliphelet King’s old gun. Well, that’s not necessarily true; I think it’s that I just like surprise “finds” like that photograph. And heck, it’s not like there’s anything else to see in West Suffield, right? And while the Internet is lacking when it comes to information on this particular old cigar factory site, I’m not concerned. 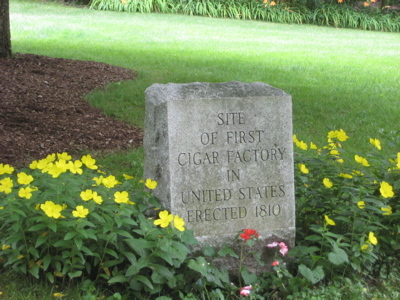 Because really, what more do you need to know other than the first cigar factory in the United States was right there, built in 1810… Right in the front yard of what is now a well-maintained house along Ratley Road just south of the Massachusetts line. 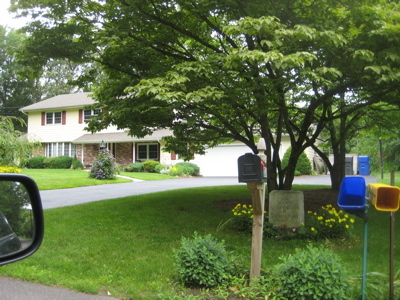 I hope the fine folks who live here are proud to be featured on CTMQ. They should be. With so many museums dedicated – at least in part – to north central CT’s tobacco industry (in Windsor, East Hartford, Granby, Suffield), I have my fill of tobacco-related history. But now… Now I’ve been to the site of the first cigar factory in the US and I’m happy. This is interesting.Glad to know this first cigar factory site. This tells the beautiful history of the cigar industry in the US many many years ago. Hoping to visit this historical place soon.